Dhokla: Dhokla or Dhokra is a vegetarian food item that originates from the Indian state of Gujarat. It is made with a fermented batter derived from rice and chickpea splits. Dhokla can be eaten for breakfast, as a main course, as a side dish, or as a snack. It can usually be bought from a sweet shop. Dhokla is usually prepared using rice and chickpea splits (Chana dal) in the ratio 4:1, soaked overnight; then the mixture is ground and this paste is fermented for four-five hours to overnight. The below recipe is the simplified version of the traditional preparation and does not take much time. Take gram flour and rice flour in a bowl. Add in the yogurt with approximately 1 cup of warm water. Mix well to avoid lumps. Leave the batter in a warm place to ferment, for 2 hours. When gram flour mixture has fermented, add in the turmeric powder and green chilly-ginger paste. Heat the steamer, for baking the dhokla. Grease a thali/plate using oil. In a small bowl mix the lemon juice, soda bicarbonate and one teaspoon of oil. Add the mixture to the batter. Pour batter into the greased thali and place it in the steamer. Cover with lid and steam for 10-12 minutes. Remove from the steamer and keep aside. When a little cool, cut into the desired shape and keep in a serving bowl/plate. Heat the remaining oil in a small pan, over medium heat. Add in the mustard seeds. When the mustard seeds begin to crackle, remove and pour over the dhoklas. Garnish the dhokla with chopped coriander leaves. Serve the hot dhokla with sweet tamarind chutney and green-chilly chutney. 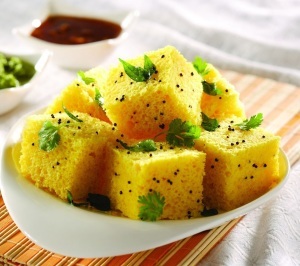 If you have any queries regarding the Dhokla recipe, please leave a comment.